Hungry for a taste of Portugal? So, whats so special about the Portuguese? The age of exploration was upon us…this was propelled by the desire for exotic spices, and it was the Portuguese Vasco da Gama who discovered the fabled spice route. Shaped by our history of a once-great seafaring nation, an empire that stretched from Brazil and the East Indies to the coast of Africa, India, Goa and to Macau in China. It was Portugal, who brought the influences of spices and diverse tastes to rest of Europe. It was then that African Birds Eye Chilli was discovered and this gave birth to what we know today as Peri Peri. earthy in style and a touch, of the exotic. With a love of peri peri and all things Portuguese, we experimented with flavours, adding our own spices (which we will keep our little secret) and developed a menu that we knew was the best! With 25 stores in South Africa, Senhor Calisto's is defined by our commitment to serving high-quality, great-tasting, affordable food using premium ingredients partnered with friendly service. …and the Senhor Calisto’s menu endeavors to stay true to the authentic, delicious flavours of Portugal. 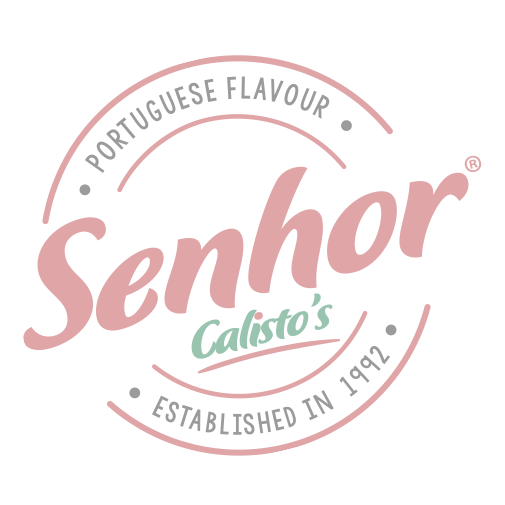 mouth-watering burgers and family meals, all prepared with the Senhor Calisto’s touch. We can honestly say, we yoked it! Need your Portugese flavour fix? Find a store near you and pop in for a visit, or order online. You can either have your meal delivered (depending on your location) or you order online and collect.